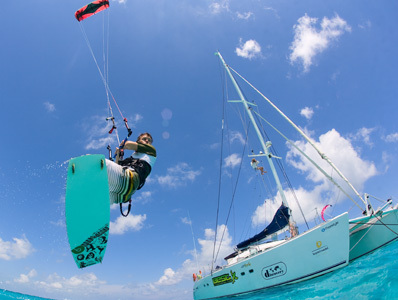 Gavin McClurg traded job-hopping for the corner office aboard a 57-foot catamaran. For the 26 investors in Gavin McClurg’s business, dividends include swimming alongside humpback whales in Polynesia, surfing 19-foot waves off the coast of Indonesia and paragliding in Palau. McClurg, 37, is the founder and chief executive of Offshore Odysseys, a five-year-long, around-the-world surfing, diving and photography expedition aboard a 57-foot, $1.2 million catamaran named Discovery. This is no charter boat; it’s a floating time-share resort. Each share (plus variable expenses) entitles an owner to one annual 10- or 14-day cruise and a piece of the boat. This month’s destination: the Mergui Archipelago near Burma, a remote area for kiteboarding (that is, balancing on a fiberglass board and steering a kite that rips the rider across the water at 30mph). In addition to arranging the trips and navigating the boat, McClurg handles all repairs, catches lobster for dinner and, if necessary, wrangles with inhospitable local officials. The Discovery hosts up to six guests and runs trips 198 days a year; McClurg uses downtime for maintenance and sailing to the next spot. After graduating from the University of Colorado at Boulder, McClurg floated from job to job, including stints as a commercial salmon fisherman in Alaska, a wilderness firefighter in Oregon and an Outward Bound instructor in the Pacific Northwest. In 1999 McClurg bought his father’s boat for $250,000 (Dad loaned 80%) and left for the South Pacific two years later. He spent the next five running charters in spots like Polynesia, New Zealand and off the coast of Sumatra. When he’d get low on cash, he’d return to the U.S. to bartend and fight fires. Burned out and tired of being broke, McClurg sold the boat, paid off the loan and headed back to the States. “I knew I wanted to keep sailing, but I didn’t want to sell charters every week,” he says. A larger, more seaworthy vessel would require serious cash. That’s where the time-share model comes in. There are 615 shares. Investors ponied up $20,000 or $30,000 per share, and five own more than one. Bruce Marks, a retired anesthesiologist from Perth, Australia, has eight, and Scott Wisenbaker, an ex-vice president at Goldman Sachs ( GS – news – people ), has six. Shareholders also pay an annual $4,100 or $5,730 per share to cover operating expenses, and another $45 per day for food and beverages. That adds up to about $250,000 in annual fees. Of that, $135,000 is split among McClurg, a chef and a first mate (who during year one was McClurg’s girlfriend, Jody MacDonald); $85,000 covers maintenance; and $12,000 goes toward insurance. When he had sold just 30% of the total shares, McClurg struck an endorsement deal with Pure Action Sports Worldwide, maker of Best kiteboarding gear. Pure Action Chief Executive Ian Huschle agreed to provide kites, lines, harnesses, boards and a cash contribution in exchange for lead sponsorship of Discovery’s expedition, which McClurg named “Best Odyssey.” McClurg also agreed to give Huschle promotional footage from the trip. “If we were to collect that on an annual basis it would cost us far in excess of what it costs for the sponsorship,” says Huschle. McClurg later lined up 17 other sponsors, including gin paragliders, Aviso surfboards and Teva sandals. They are all paying in kind. By October 2006, nine months into their hunt, McClurg and MacDonald had raised $840,000 of the $1.2 million they needed for the boat–but their own stash had dwindled to $200. They e-mailed Bruce Marks, the Australian anesthesiologist, who agreed to shell out for two more shares. “I knew Gavin, and I wanted the trip to happen,” says Marks, 47. McClurg borrowed $50,000 from an uncle and the remaining $250,000 from Randy Campadore, a family friend and shareholder. Odyssey guests have swum across the equator (on the way to the Galápagos Islands), paraglided 2,500 feet above Tahiti and scaled palm trees in Haraiki, part of French Polynesia, to harvest fresh coconut for rum drinks. When night falls they dine on fresh seafood they have caught and play cards. The loser of one popular game has to do a “forfeit,” such as singing “Puff the Magic Dragon” at the top of the mast, drinking beer through a snorkel and even swimming in shark-infested water.